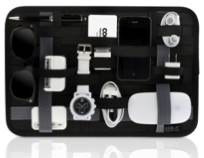 New York City, NY, US – July 18, 2011 – Cocoon Innovations, the award-winning creator of stylish bags and cases with purpose, is excited to announce the availability of the Sleeve2 at Apple stores across the country. Lined with the shock resistant textile DEFLEXION, the cleverly designed Sleeve2 fits and protects both a 13" MacBook/MacBook PRO and an iPad. The Sleeve2 comes equipped with the GRID-IT, a rubberized woven elastic object retention system, perfect for organizing laptop accessories, iPod, iPhone, earbuds and more. "We're really excited to see the Sleeve2 in Apple stores," said Dov Friedman, Director of Marketing. "The ability to fit and protect a MacBook and iPad simultaneously makes the Sleeve² the optimal bag for the Apple enthusiast." An adjustable, removable, padded shoulder strap ensures a comfortable carrying experience. The elastic hand strap and roller bag strap located on the back of the Sleeve2 can secure onto most roller bag handles. Those features, combined with ability to safely carry a tablet and notebook in just one carry-on make the Sleeve2 the ideal companion for air travel. The stylish Sleeve2 is available in black and red, each with a dark grey interior at Apple Stores and on www.cocoonbags.com for $69.99.